$8.95 In stock. Order in the next 9 hours, 20 minutes and it will go out today! Audiences love when something disappears or appears by magic. 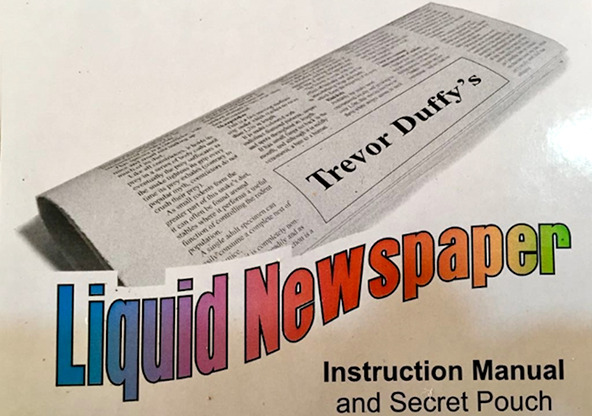 This is a wonderful trick for children's Magic shows involving a regular (tabloid size) newspaper, and a small jug from which water is poured into (what appears to be) the pages of the newspaper. The newspaper is shown before and after, from both sides to be absolutely normal, even turned upside down! The pages can be flipped through again. Amazingly, the water has completely vanished! Finally, the newspaper is folded up once more and the water is poured out into a glass. Everything is left absolutely dry and unblemished by the water. There is an added option of being able to pour out red liquid instead of plain water. You are supplied with one specially made plastic insert with is easily fitted into the Tabloid size newspaper. It is durable enough to last almost indefinitely.